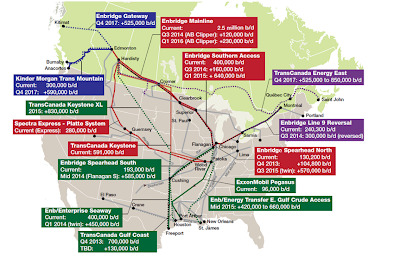 also heard about Enbridge’s Flanagan South Pipeline? Now under construction across the Show-Me State, this less infamous cousin to K-XL, shares the same purpose, to deliver heavy tar sands oil (or dilbit, for diluted bitumen) from Alberta, Canada to the U.S. Gulf Coast. oil are all part of the new fossil fuel landscape. Their development has altered energy markets, lowered some prices, reduced U.S. imports from overseas and, at the same time dramatically raised concern about climate change. Peaceworks and other groups working to address the climate crisis are now working overtime to educate and advocate on several fronts simultaneously. More, Cheaper Fuel: What’s the Problem? Just a few years back, there was great concern over Peak Oil and Peak Gas. Many believed that we’d reached the point of diminishing returns on exploration and these finite fuels were running out on us. Now, with new extraction technology, the real problem is too much carbon-based fuels. Yes, fossil fuels are still finite, and would eventually be depleted, but in the interim, if we keep burning them, we are likely to cook the planet. As Bill McKibben, of 350.org, has made clear to millions, there is a “Terrifying New Math” of climate change. We know how much carbon the atmosphere can absorb without triggering catastrophic consequences, and the amount available in proven reserves of oil, coal, gas, tar sands, etc. is approximately five times this amount. That’s right, 80 percent of what we know is out there needs to be left in the ground, or we are inviting disaster.